Three veterinary summer camps will offer youth the first-hand experience of being a veterinarian, giving them an early insight into a potential career field. 2013 Vet Campers exam a horse with a stereoscope. 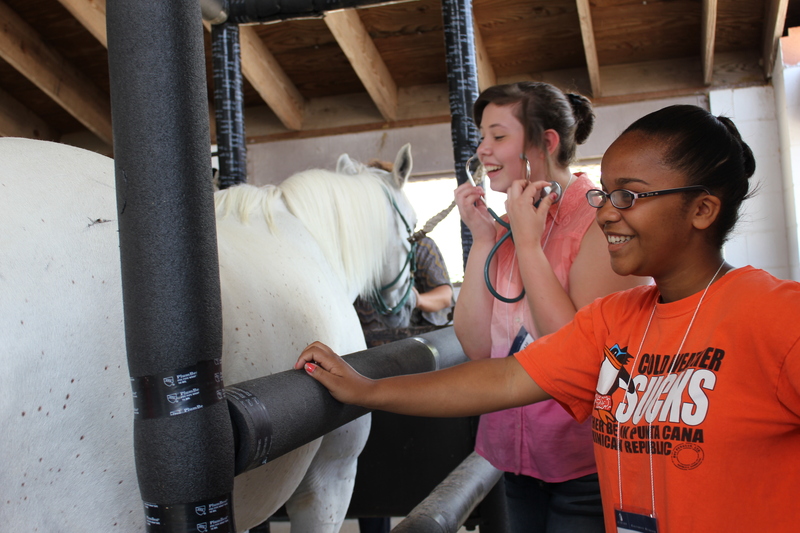 A total of 90 junior and high school students will participate in camps at Auburn University’s College of Veterinary Medicine, coordinated in partnership with Auburn’s Office of Professional Continuing Education. The camps are popular, booked months in advance of the deadline. This year’s camps are full and are no applications are being accepted. Two Senior Veterinary Camps, one for 9th to 11th graders and one for high school seniors will be held June 1-5, and a Junior Veterinary Camp, for 6th to 8th graders will be July 13-17. All three Veterinary Camps are conducted by veterinary students, faculty, and staff and offered to students interested in the field of veterinary medicine. Christine Garrett and Jessie Kinman are both third-year veterinary students and Vet Camp student directors. Garrett said that she is excited about the opportunities that the camps offer, and grateful to be involved. “This summer is going to be fantastic. I can’t wait to meet all of the students,” Kinman said. 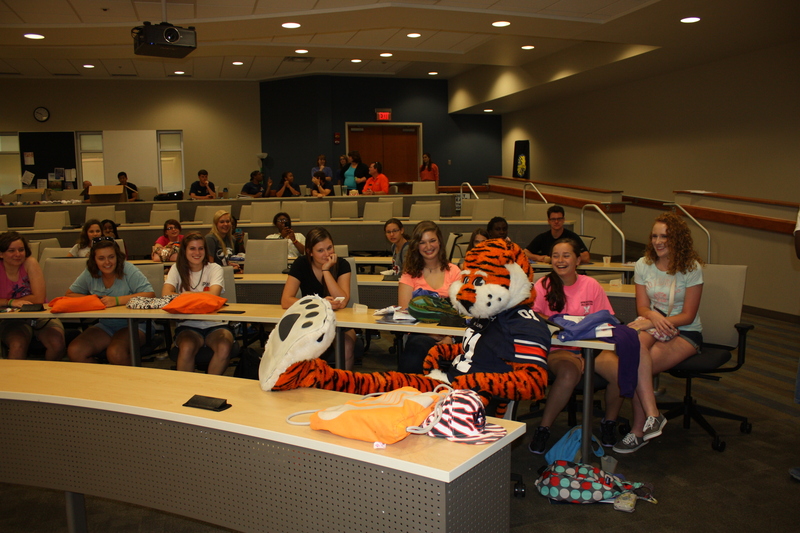 Aubie visits the 2014 Vet Camp. Camp participants will also learn about the college’s Southeastern Raptor Center, home of War Eagle VII, Nova, as well as tours of the equine, dairy and beef units. Students will learn about public health, wildlife, anatomy, imaging, and first aid, as well as gain valuable mentoring about veterinary careers. “The skills students learn at Vet Camp are not just important for future veterinarians, but also for any current or future pet owners,” Garret said. “We hope they will take at least one thing away from Vet Camp and share it with a parent, family member, or friend. 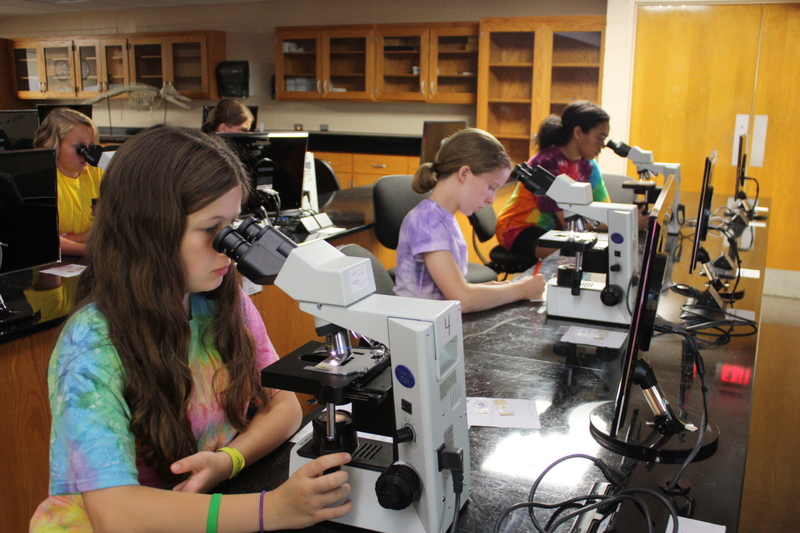 6th – 8th grade campers use microscopes during the 2014 Vet Camp.